The 2000 sqm of villa’s property is surrounded by the enriched greenery, pine, palms and lemon trees. It is located on a dead-end street which eliminates the traffic noise completely. The villa is suitable for maximum 14 people and is perfect for families or group of friends looking for a complete tranquility and privacy. The newly built large-heated-infinity swimming pool offers an amazing panoramic sea view. The guests can relax on the three pure-nature terraces with sun beds, chairs and umbrellas. 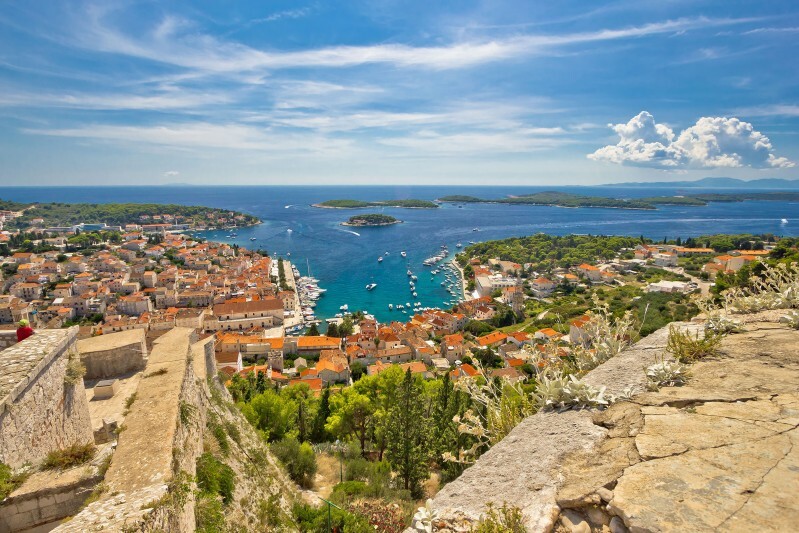 The island Hvar is the longest island in central Dalmatia with an amazing coastline, beaches, crystal clear seawater, olive and lavender plantations and wine yards, which are harmoniously combined with the medieval villages as well as Roman and Greek times ruins. It is known to receive the most sunlight throughout the year than any other place in Croatia. All 7 bedrooms have ensuite bathrooms, satellite LCD TV, Internet connection (Wi-Fi), air-conditioning (heating or cooling). 6 rooms offer direct sea view, only 7th room offers no sea view, no direct light. The villa’s manager lives in the separate house next to the villa and is at disposal for providing concierge services. 1 bedroom: a king-size bed, direct access to the terrace with sea view. 2 bedroom: a king-size bed, direct access to the terrace with sea view. 3 bedroom: a king-size bed, direct access to the terrace with sea view. it can be used separately or connected with bed 3. – bed 5 bedroom: accessed by a spiral staircase, direct access to a balcony with panoramic sea view. – bed 6 (Master suite): a very spacious bedroom with a king-size bed, a terrace and a separate living room. An ensuite bathroom is very large and has a bathtub and a shower. ● Rock (Executive suite): a comfortable bedroom with a king-size bed, a dressing room, a living room, a balcony. The bathroom is equipped with bathtub and shower and also offers sea view. ● An extra large private terrace equipped with 2 sun beds and umbrella. ● Due to the specific nature of grounds, number of stairs, terraces and lack of lawns, Young children should be supervised at all times.